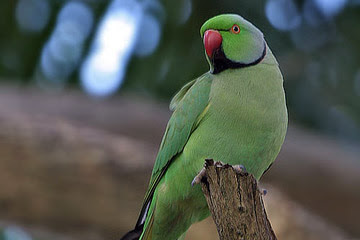 The green parakeet with the pink and black neck ring around the neck, has been feasting on my pears. It let me take these three pictures and then went on eating and drinking. Later that day a blackbird, pigeon and a Flemish jay – a bird that I will forever associate with a visit of my long deceased father – had their treat but I couldn’t get them on my camera. After they have fallen on the ground wasp, flies, ants and slugs eat the rest of them.